The end of this month is CHA (Craft & Hobby Association) in Los Angeles. I'll be gone for 5 days, I think my husband is gonna starve! 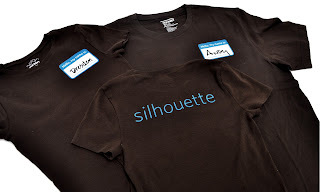 Well here at Silhouette we make shirts for everyday we are there, here is just a very simple fun shirt we made using all Heat Transfer. Our other shirts are quite a bit cuter, but I can't show them just yet!